Alfredo Trevino, owner of Nana's Tacos looks around as he inspects as he walks through water after heavy rains caused water to rise and flood whole neighborhoods on Thursday, June 21, 2018, in Weslaco. 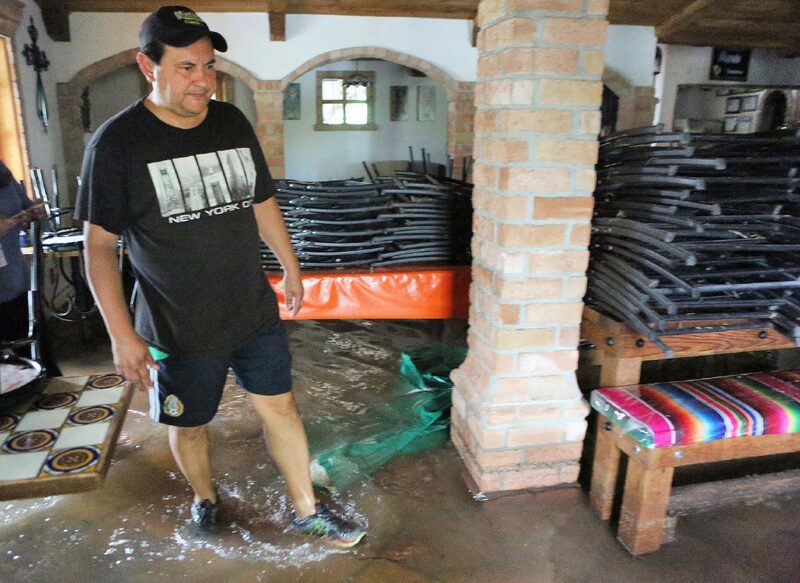 WESLACO — Alfredo Treviño waded through the knee-deep, murky water that swamped his taqueria Thursday afternoon after vicious thunderstorms and showers dumped 15 inches of rain on the Mid-Valley in only four hours the day prior. 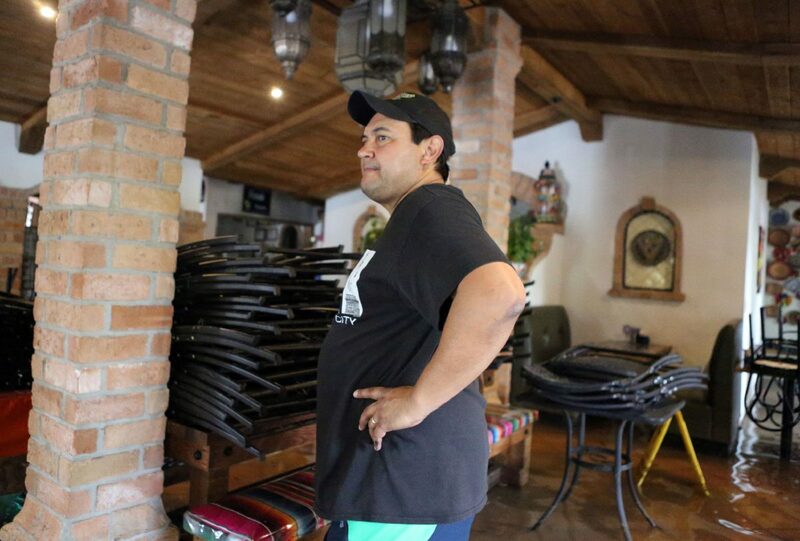 Typically bustling with customers, Nana’s Taqueria remained closed through the weekend as Treviño faced the daunting task of clearing the eatery of more than a foot of water. He’s unsure of how long the cleanup process will take or when he will re-open for business. “I feel upset when I look at my business,” Treviño said, adding he doesn’t blame anyone in particular and instead accepts the consequences dealt by Mother Nature. 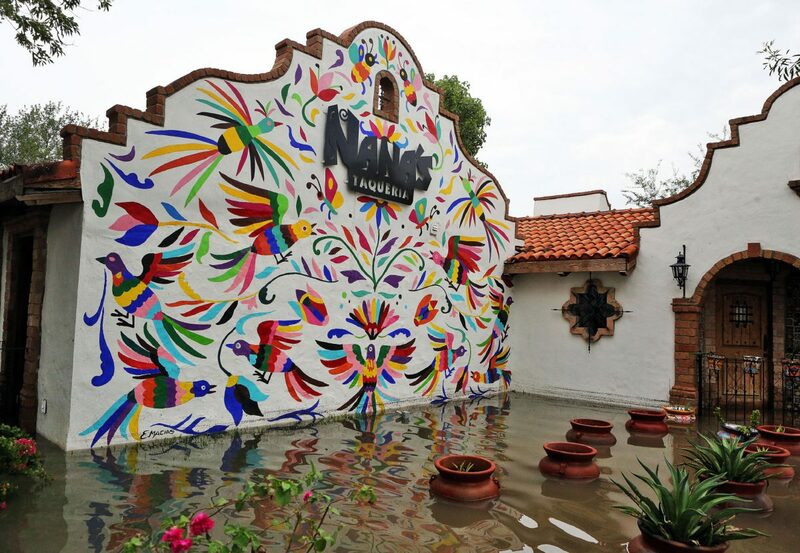 Nana's Tacos is surrounded by water after heavy rains caused water to rise and flood whole neighborhoods on Thursday, June 21, 2018, in Weslaco. Alfredo Trevino, owner of Nana's Tacos walks through water as he inspects the restaurant after heavy rains caused water to rise and flood whole neighborhoods on Thursday, June 21, 2018, in Weslaco. Once filled with vibrant live music from local musicians who perform in its outdoor courtyard, the space was mournfully quiet Thursday, filled only with the sound of swooshing floodwater as he moved throughout it, assessing the extent of the damage. 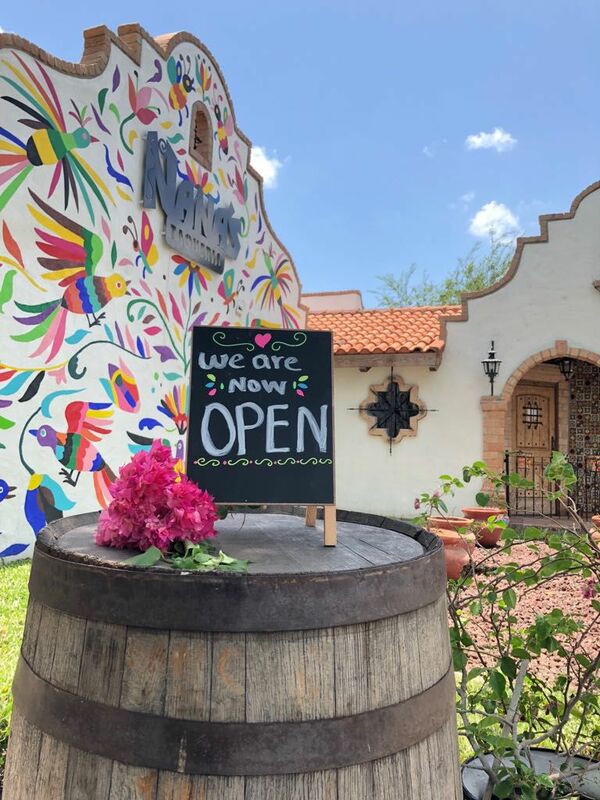 “It breaks my heart,” he said of the condition of the restaurant he opened nearly a decade ago, which he had painted and designed to resemble aspects of Guanajuato, Mexico. Though heartbroken, Treviño smiled as he recalled how the family-owned restaurant, which serves what patrons say are the “best lonches in the Rio Grande Valley,” got started on Jan. 10, 2010, an unforgettable morning etched in his mind. That year, Treviño and his wife Roxanna, who lived in what’s now the taqueria, were in a rough patch financially. One evening, after pinching enough pennies, they cooked a pachanga’s worth of grilled chicken wings and Mexican rice. They gave some to workers at the Pioneer Hi-Bred across the street, who — so impressed by the flavors — asked Treviño why he hadn’t opened a restaurant on the high-traffic corner of International Boulevard and East 18th Street, just outside city limits. A former civil engineer in Mexico who became a U.S. citizen in 2002, Treviño had no experience in the restaurant industry. His wife ran a business in Progreso, Mexico, selling home decor, but they needed a way to turn a financially turbulent chapter of their life around. Over the next few months, they borrowed money to purchase materials to pave four parking spots outside their home and obtain permits to run a restaurant. They lined their front yard with plants in colorful terra cotta and talavera pots and vivid magenta Bougainvilleas and strung papel picado from the ceiling of their living room, transforming their home into a small taqueria, which they eventually expanded and revamped into what it is today — Nana’s, named after one of their three daughters and designed by another who studies architecture at Texas A&M University. The county received an “unprecedented” amount of rain late last week, up to 18 inches in certain areas, according to a Hidalgo County news advisory. “We started from zero, a couple times, three times in my life,” Treviño said, remaining optimistic that with time, he’ll be selecting beef for his famous lonches. The county awaits a federal disaster declaration, which would prompt assistance for homeowners and small business owners through FEMA grants. By Friday, Treviño and a handful of his 40 employees began cleanup efforts, using bleach and dehumidifiers inside the dining area and removing damaged property. “I am a proud U.S. citizen … in our country, we never say ‘no.’ We never say ‘I can’t,” he said.